Aerial View of AMARG, 16 May 1992. Welcome sign at AMARG before its 2007 name change. Boeing 707s being used for salvage parts for the C-135 airframe at AMARG. Navy and Marine Corps McDonnell Douglas F-4 Phantom II fighters in storage at AMARG. 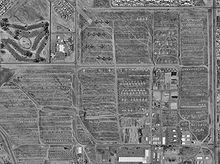 The 309th Aerospace Maintenance and Regeneration Group (AMARG), often called The Boneyard, is a United States Air Force aircraft and missile storage and maintenance facility in Tucson, Arizona, located on Davis–Monthan Air Force Base. AMARG was previously Aerospace Maintenance and Regeneration Center, AMARC, the Military Aircraft Storage and Disposition Center, MASDC, and was established after World War II as the 3040th Aircraft Storage Group. AMARG takes care of nearly 4,000 aircraft, which makes it the largest aircraft storage and preservation facility in the world. An Air Force Materiel Command unit, the group is under the command of the Ogden Air Logistics Complex at Hill Air Force Base, Utah. AMARG was originally meant to store excess Department of Defense and Coast Guard aircraft, but has in recent years been designated the sole repository of out-of-service aircraft from all branches of the US government. The arid climate of the region makes AMARG an ideal location for storing aircraft, as there is very little humidity in the air that would corrode metal. AMARG was established in 1946 as the 4105th Army Air Force Base Unit to house Boeing B-29 Superfortress and Douglas C-47 Skytrain aircraft. Davis–Monthan Air Force Base was chosen because of Tucson's low humidity, infrequent rainfall, alkaline soil and high altitude of 2,550 feet (780 m), reducing rust and corrosion. The hard soil makes it possible to move aircraft around without having to pave the storage areas. In 1948, after the Air Force's creation as a separate service, the unit was renamed the 3040th Aircraft Storage Depot. In 1965, the depot was renamed the Military Aircraft Storage and Disposition Center (MASDC), and tasked with processing aircraft for all the US armed forces (not just the Air Force). 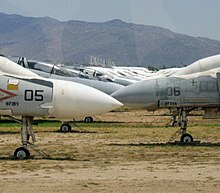 The U.S. Navy had operated its own boneyard at Naval Air Station Litchfield Park at Goodyear, Arizona, for Navy, Marine and Coast Guard aircraft. In February 1965, some 500 aircraft were moved from Litchfield Park to Davis-Monthan AFB. NAS Litchfield Park was finally closed in 1968. In the 1980s, the center began processing intercontinental ballistic missiles for dismantling or reuse in satellite launches, and was renamed the Aerospace Maintenance and Regeneration Center (AMARC) to reflect the expanded focus on all aerospace assets. In the 1990s, in accordance with the START I treaty, the center was tasked with eliminating 365 B-52 bombers. The progress of this task was to be verified by Russia via satellite and first-person inspection at the facility. Initially, the B-52s were chopped into pieces with a 13,000 pound guillotine winched by a steel cable supported by a crane. Later on, the tool of choice became K-12 rescue saws. This more precise technique afforded AMARG with salvageable spare parts. In May 2007, command of AMARG was transferred to the 309th Maintenance Wing, and the center was renamed the 309th Aerospace Maintenance and Regeneration Group. Ogden Air Logistics Complex, 1 Oct 2012-. AMARG employs 700 people (approximately 500 DoD civil servants, and 200 contractors). The 2,600-acre (11 km2) facility is adjacent to the base. On average, AMARG returns approximately $500 million worth of spare parts to military, government and allied customers. Congressional oversight determines what equipment may be sold to which customer. Ejection seat charges and classified hardware are removed. All aircraft are carefully washed with fresh water to remove environment residue and then allowed to dry. The fuel system is protected by draining it, refilling it with lightweight oil, running engines to coat fuel system plumbing and engines, and then draining it again. This leaves a protective oil film. The aircraft is sealed from dust, sunlight, and high temperatures. This is done using a variety of materials, including a high tech vinyl plastic compound that is sprayed on the aircraft. This compound is called Spraylat after its producer the Spraylat Corporation, and is applied in two coats, a black coat that seals the aircraft and a white coat that reflects the sun and helps to keep internal temperatures low. The plane is then towed by a tug to its designated "storage" position. On average the Group annually receives 300 aircraft for storage and processes out about the same number (with 50 to 100 of those returning to flying service). Aircraft that fly again either return to the U.S. Military services, U.S. government agencies (such as the U.S. Coast Guard, U.S. Forest Service, and NASA) or are sold to allied governments under the Foreign Military Sales program. AMARG is a controlled-access site, and is off-limits to anyone not employed there without the proper clearance. The only access for non-cleared individuals is via a bus tour which is conducted by the nearby Pima Air & Space Museum. Bus tours are on Monday to Friday. From April 2013 onwards the base has also hosted an annual 10K/5K run/walk which is open to the general public. AMARG has been a site of filming for scenes in several films and television productions, despite the security of AMARG and the base in general. The most recent and notable of these is Transformers: Revenge of the Fallen. The exterior scenes of the Smithsonian set were actually filmed in the Boneyard. The 1986 film The Wraith starring Charlie Sheen had some scenes that were shot at the 309 AMARG. 309 AMARG was featured in an episode of TNT's The Great Escape. ^ a b Official 309th AMRG Renaming Ceremony Archived 24 January 2008 at the Wayback Machine. ^ USAF AMARC Fact Sheet Archived 21 August 2007 at the Wayback Machine. ^ Hanbury Evans Newill Vlattas and Company (January 1998). "Design Compatibility Standards Davis – Monthan Air Force Base Tucson, Arizona" (PDF). U.S. Army Corps of Engineers. Archived from the original (PDF) on 14 January 2009. Retrieved 28 December 2009. ^ Napolitano, J. (May 2005). "Arizona's Military Installations: Ready for the Transformation of the Department of Defense" (PDF). azgovernor.gov. Archived from the original (PDF) on 23 November 2009. Retrieved 26 December 2009. ^ AMARC Experience Story Archived 28 September 2007 at the Wayback Machine. ^ "START Treaty" (PDF). U.S. Department of State. 31 July 1991. Archived (PDF) from the original on 30 November 2009. Retrieved 28 December 2009. ^ Norris, R.S. (1995). "Nuclear Notebook". Bulletin of the Atomic Scientists. 51 (1): 69. Accessed 28 December 2009. ^ a b c See Mueller, Robert (1989). Air Force Bases, Vol. I, Active Air Force Bases Within the United States of America on 17 September 1982 (PDF). Washington, DC: Office of Air Force History. p. 103. ISBN 0-912799-53-6. ^ "Davis-Monthan Air Force Boneyard in Tucson: Boneyard Layout, Operations, Tours, and Maps". www.airplaneboneyards.com. Retrieved 1 April 2019. ^ Pima Air & Space Museum Official Site. ^ "Transformers 2 Filming at AMARC". Archived from the original on 3 March 2016. Retrieved 10 December 2009. Wikimedia Commons has media related to Aerospace Maintenance and Regeneration Center.